Non chlorine bleach is a type of bleach which does not damage the environment unlike chlorinated bleach. Chlorine bleach is a solution of 5.25% solution of sodium hypochlorite added in water. Chlorine acts as a disinfectant and hence it is added in the swimming pool; however it can has negative effects on the human body, animals and plants. Chlorine gas can have many negative effects of the human beings as well as animals and plants. • Chlorine gas can cause nose and throat irritation in human beings. • When chlorine gas is released or leaked out, it can resulting the killing of beneficial organisms like health bacteria, virus, fungi etc. to avoid such damage to the environment it is advisable to use Non Chlorine Bleach. Using non chlorine bleach as an alternative in water will ensure that your family does not have any negative effects. • Chlorine can cause cancer. • Chlorine gas meddles with the respiratory system as it affects the mucus membrane and leads to heavy coughing and sneezing. The symptoms can increase if the person is already allergic to chlorine. • Substances which have chlorine can burn the skin. How does non chlorinated bleach works? If a person has been a chemistry student then it will be very easy for him/her to understand how these kinds of non chlorinated bleaches work. There are many different types of bleach which can act as oxidizing agents. These non chlorine bleaches are also called oxygen bleaches. Chlorinated bleach is one of them, but non chlorinated bleaches can also so the same work. The non chlorinated bleaches have ingredients like sodium percarbonate and sodium perborate. These non chlorine bleaches are very good for clothes as it does not harm the fabric and also maintains the bright colors. They do not oxidize the clothes heavily hence the color of the clothes remains the same. It is advisable to use non chlorine bleaches for household purpose as it is gentle on the skin, clothes and are environment friendly also. Are non-chlorine bleaches good disinfectants? Due to oxidation procedure, the cell membrane of small organisms like bacteria and fungus are destroyed, hence they are killed. Now that we know that non chlorine bleach can serve the same purpose, they are capable of killing the bacteria, virus and fungi too. However we should also know that chlorine bleaches are stronger disinfectants than their non chlorine counterpart. Example: Hydrogen peroxide is non chlorine bleach which kills small organisms. These kinds of bleaches can be used to sanitize washroom pots as they are fine on skin also. Now you must be wondering where can you get non chlorinated bleach? These bleaches will be available in grocery store which keeps laundry items like detergent bars, detergent powders etc. one of the example of a famous non chlorine bleach brand is Clorox 2. It has hydrogen peroxide as its primary ingredient and is eco friendly too. How to use non chlorine bleach? • Dip cotton or a cloth in the Non Chlorine Bleach and dab the spot on the garment where you want to apply. This will make sure that the color is not lost. • Pour the bleach on the stain and rub it a bit. After doing that place the cloth in the wash machine. • Add the regular detergent in the washing machine and wash as usual. • Fill the bucket with water and add1/2 cup of non chlorinated bleach. • Put a sponge into the bucket and scrub the areas with the solution. • After doing that clean the sponge and the bucket with clean water and dry the area with towel or tissue. If a person does not want to use chlorine or even non chlorine bleach, then there is a regular alternative called vinegar. 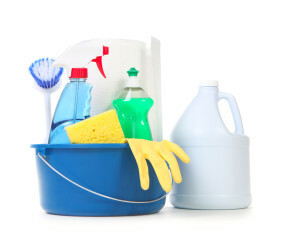 Vinegar is a very effective cleaning agent as it has acetic acid. Remember to not use vinegar with bleach! It can cause toxic reaction. Another alternative is baking soda. These products do not have chemicals and are safe if children or babies are caught up with it.